Cape Town Harbour may soon get a desalination plant as further studies into the viability of this option have been approved by Transnet SOC Ltd. The plant will assist in converting ocean water into drinking water through seawater reverse osmosis (SWRO), and if studies find this option to be viable it could become a reality by as soon as 2020. Transnet National Ports Authority’s (TNPA) Cape Town acting port manager, Alex Miya, told IOL that the next step would be to appoint consultants to perform studies that could be concluded by September. In the meantime, the port will align with the City’s initiatives to supply extra water. “The port is confident the municipality will ensure a water-resilient region through a mix of water sources. We have considered a few options to ensure economic sustainability. One is an SWRO plant for port use. This is being explored in conjunction with various regulatory authorities and has received support from Transnet to proceed with further studies,” Miya said. If the plant is approved, it will be located at the Quay 700 port area and would be expected to provide an average of 1-million to 3-million litres of water a day. The port has also been providing assistance with regards to the potential site availability for a permanent plant. As dam levels have dropped below the 50% mark again this week, there can be no doubt that it is a worthwhile initiative to look further into so the city can provide more water for its residents and fight back against the looming threats of drought. Sources: , . 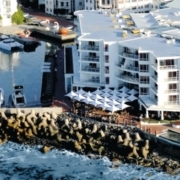 Image sources: Cape Grace , .